This blog is maintained by Dr. Shermin de Silva. 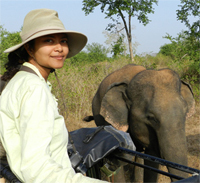 I direct the Uda Walawe Elephant Research Project, in Sri Lanka. I am the President and Founder of Trunks & Leaves (USA) and a Trustee of EFECT (Sri Lanka). The complementary missions of these two organizations are to facilitate basic research on Asian elephants, as well as to disseminate that understanding to the public, wildlife managers, and policy makers, locally and globally. More about me here. Other regular contributors are Deepani Jayantha (DJ), U. Sameera Weerathunga (USW) for the Udawalawe Elephant Research Project. This blog also features guest posts from students, researchers and other conservationists.